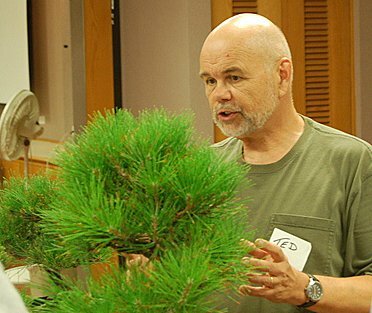 Although I had been curious about bonsai for years, I got hooked in about 2000 when my daughter and I dropped in on one of the club’s Saturday workshops at GVCC, looked around and asked some questions. Following a few months of playing on our own, we joined the club to learn more. My interests are eclectic and I’ve tried many species including, but not limited to, azaleas, Japanese quince, Japanese and trident maples, elms, several different pines, junipers, cedars, and camellias with varying degrees of success and failure. I’ve always been a tool nut and appreciate good tools well cared for. I recently started woodworking where really sharp tools are a matter of considerable importance (dull tools don’t do good work). In the process of learning to get a good edge on chisels and planes, I also honed my sharpening skills for bonsai tools. I have found the information in bonsai sources about sharpening to be rather limited compared to what one can find about woodworking tools, so I thought it would be useful to impart what I have learned to interested club members. Spring is upon us. Most trees are definitely coming to life in the past couple of weeks and beginning to show their new foliage. No snow here, but we did get a smattering of rain. Careful with your wiring at this stage. It is a great time to start guiding and shaping the new branches, but also a time for munching little critters to show up. It’s not too early to start fine tuning your entries for our show in May. I’m sure that I’ll see many of you at the Bonsai-A-Thon this weekend at the Huntington! As usual, Mel’s presentation was unusual and entertaining. As a quick introduction, he took a slender Italian Cypress seedling and with one length of wire rapidly turned it into a twisted shohin. Now, talk about unusual, since cypress isn’t very good bonsai material he plans to try grafting shimpaku juniper to it. I’m very curious to know how it turns out. Mel then took a rather unpromising looking 5-gallon prostrata juniper, and with judicious use of raffia, large wire wrapped around the trunk, guy wires, and brute strength, turned it into a contorted bunjin which he potted into a large growing container. Few people may know this, but Ernie Witham, our new Treasurer, is famous! If you don’t believe me, look him up at http://www.erniesworld.com/ . Ernie writes the humor column “Ernie’s World” which appears in the Montecito Journal and is syndicated through Senior Wire News Service. His humor has appeared in many publications and anthologies, including a dozen best-selling Chicken Soup for the Soul books. He is the humor workshop leader at the prestigious week long Santa Barbara Writers Conference and has led other workshops. 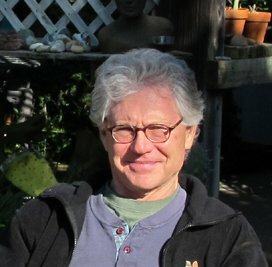 He often writes about bonsai in his column, most recently in the 29 January- 5 February 2015 edition of the Montecito Journal. That’s Ernie (at left) in the picture. At the Santa Barbara-Toba Japan Sister City Organization’s Shin Nen Kai New Year’s dinner on February 8 at the Faulkner Library, Tom Post gave a presentation on bonsai and Susanne and Carroll Barrymore talked about bonsai pots. Their presentations and the accompanying mini-display of trees were very well received. 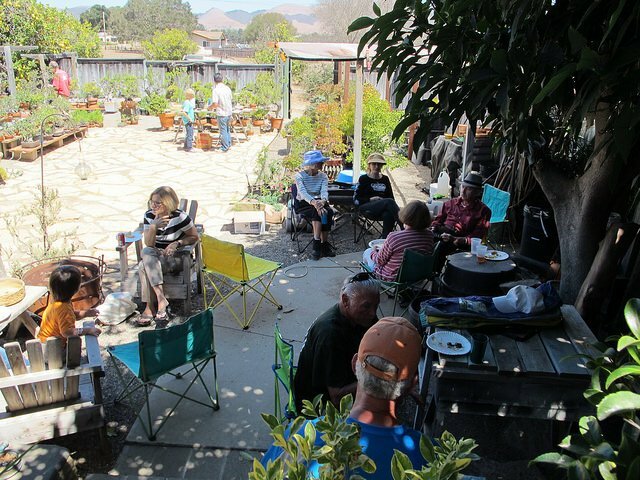 March 21: Bonsai Club Of Santa Barbara: Saturday Workshop With Guest Instructor. 1151 Oxford Road, San Marino. 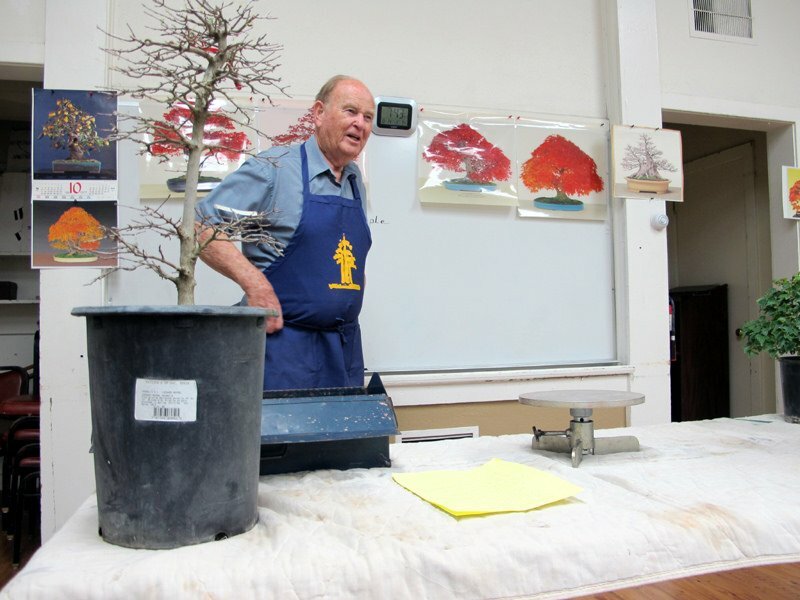 Saturday–Sunday, 10:30 a.m.–4:30 p.m. California Bonsai Society presents its 58th annual show, featuring more than 100 beautiful specimens created by bonsai masters. General admission. Brody Botanical Center. Regular Tuesday evening meeting. Leroy Kubel’s annual presentation of club events of the past year.